What your wants and financial needs are and how you can achieve your financial goals. She shares her personal stories of learning about investing, her investing mistakes and successes, and her many years of experience as an investor and Certified Financial Planner®. Most importantly, she’ll help you realize what your beliefs and values about money are so you can comfortably and knowledgably take on a leadership role in handling your finances. •	Take a financial inventory of your current situation. 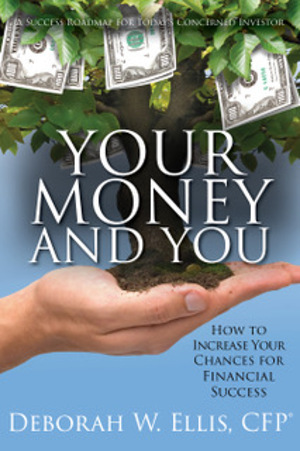 •	Create a saving and spending plan that accurately reflects what you save and spend. •	Understand the wonders of compound interest. •	Become knowledgeable about stocks, bonds and themarkets. •	Find money in new places you never considered. •	Think long-term about investing. •	Hire the right financial advisor and other team members to help you achieve your goals. It’s never too late or too early to take control of your money and make it work for youso you don’t have to work so hard.Let Deborah W. Ellis, CFP® provide you with the answers you seek in Your Money and You.